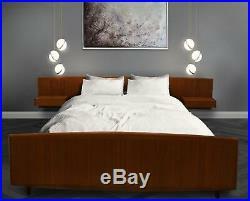 VINTAGE DANISH MID-CENTURY TEAK DOUBLE BED WITH SIDE TABLE AND DRAWERS. Made and designed in Denmark late 1960, s , beautiful teak bed frame, featuring built in side tables each with a drawer, tapered legs and wooden slates. This bed can be easily assembled. Condition: In very good vintage condition and structurally sound. Dimensions : L:195cm x W: 145cm headboard W:235cm. NEW MATTRESS L:190cm W:140cm. This is a beautiful Vintage Bed frame with new high end mattress. The item “DANISH RETRO MID CENTURY MODERN TEAK DOUBLE BED 1960′s” is in sale since Sunday, November 11, 2018. This item is in the category “Antiques\Antique Furniture\Sofas/Chaises\20th Century”. The seller is “privatedrive123″ and is located in London. This item can be shipped worldwide.